Walking into the Freshman Academy, I immediately notice a silver dragon sticking out from the wall. Each scene on the wall takes place in different time periods and I get a sense of how hard the club that put this together must have worked. Although I have never seen an episode of “Doctor Who” in my life, this club’s wall is one of the ones that I remember compared to the others — the Whovians of Wando. World Geography teacher Christa Simpson knew that this would be the club for her when she began having discussions with one of her students in class, junior Colby Tierney. Although the idea of the club forming came up, Simpson was in charge of Wando’s Photography Club at the time. She knew that she would finish off the year strong with the club and then that next year would switch to running the Whovians of Wando club with Tierney at her side as president. When it came time for the club’s first meeting, not a lot of people showed up due to it being during lunch. However, this did not make Simpson and Tierney throw away everything that they hoped for when creating the club. Instead, they decided to move it to Friday mornings and hoped that doing so would make the number of members grow. Unlike a majority of Wando’s clubs, the Whovians sometimes will do activities outside of Wando. Back in October, the club had a get together at a club member’s house for the premiere of the show’s latest season. 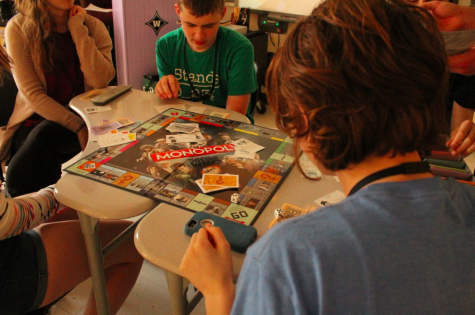 The Whovians of Wando play a “Doctor Who” inspired version of monopoly. After that, months flew by and eventually it was time for Wando’s annual wall decorating contest. The year before, the Whovians had received second place for their wall design but were determined to win first this time around. Since there are five different doctors and they travel through time, the Whovians decided that they wanted to stick with a theme of time travelling. They displayed important events in history that were mentioned in the show, including Pompeii, the Orient Express and World War II. The Whovians displayed a future time with an alien prisoner as well. The day of the pep rally, Simpson walks into the gym for the freshmen and sophomore pep rally wondering what would happen after all of the club’s hard work and winning second place the year before. When it came time, the judges were finally ready to announce who had won. As luck would have it, the Whovians received first place for their wall design. Typical club meetings consist of sitting in Simpson’s room and watching an episode of Doctor Who. Discussions of that episode will sometimes take place along with trivia matches between members. The Whovians meet every Friday at 7:30 a.m. in Simpson’s room, E-216. And just to show how laid back the club is, all that is required of future members is that they love Doctor Who.